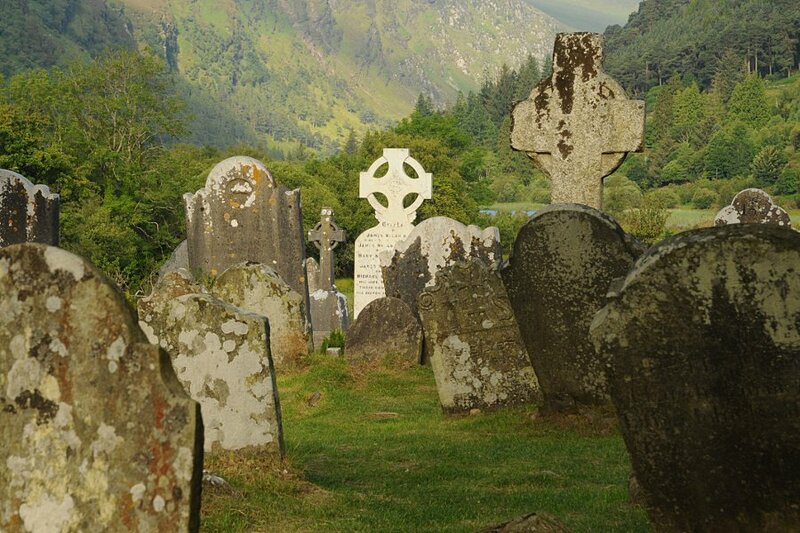 Just a short drive from the Glenmalure Lodge is the neighbouring valley of Glendalough. The Monastic City, which is located in the centre of the valley, has long been a place of pilgrimage. The natural beauty of the two lakes and the surrounding mountains draw crowds in their own right, many of whom come to walk one of the many trails in the valley. 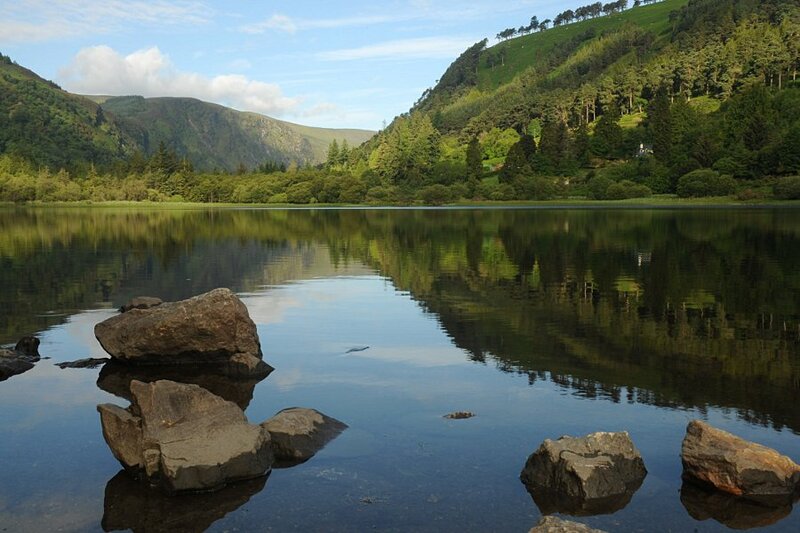 Saint Kevin came to Glendalough to seek solitude and meditate in the beauty of the ‘valley of the two lakes’. He was widely revered as a very holy man and soon a steady stream of monks followed in his footsteps. A monastic settlement was founded in the 6th Century and this gradually expanded to include seven churches in the immediate area. It was during this time that many manuscripts were written here by the monks. 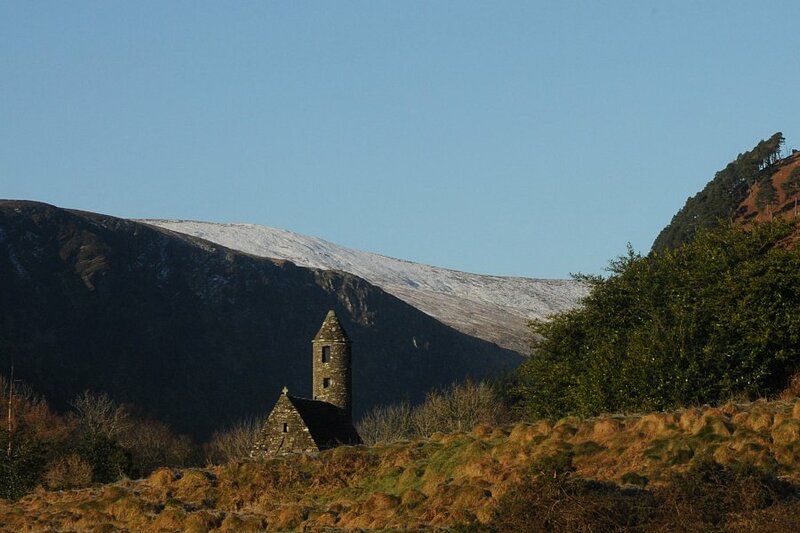 Today, Glendalough is instantly recognisable by it’s iconic round tower in the centre of the Monastic City. The solitude that St Kevin once desired has now been superceded by a bustling tourist mecca. The Visitor Centre close by and is where to source guided tours and more history of the area. Camaderry is the mountain that separates the valleys of Glendalough and Glendasan. It was in the 1790’s that a rich vein of lead ore was found in this mountain. 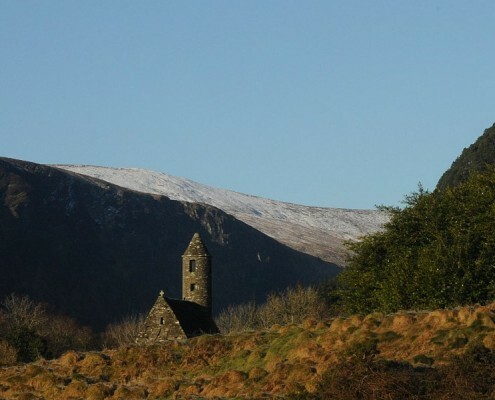 The first phase of commercial mining began on the Glendasan side in 1825 and exploration work began later on the Glendalough side in the 1850’s. Through waves of rises in demand, declines and periods of inactivity, the mines eventually came to a complete close in 1957. Today there is still plenty of evidence of the mines around in both valleys, from the slag heaps on the mountainside to the ruins of crushing mills, pump houses and old miner houses. In the 1850’s, over one million trees were planted in Glendalough so timber beams could be to be used as props in the shafts and tunnels of the mines. Some of these trees are still visible around the valley. The feral goats that roam around the quieter corners of Glendalough are descendants of those that were kept by the miners as a source of milk and cheese. 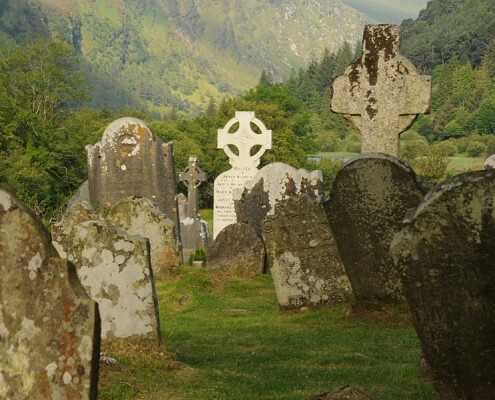 In addition to the rich history of Glendalough, the area is known for its low-level walking trails. There are numerous looped walks of various lengths in the valley that make for a pleasant day. There is also the Wicklow Way, which is a long-distance trail that passes through the valley and crosses the shoulder of Mullacor before descending into Glenmalure. The walk is of medium difficulty and takes 4 hours to complete. 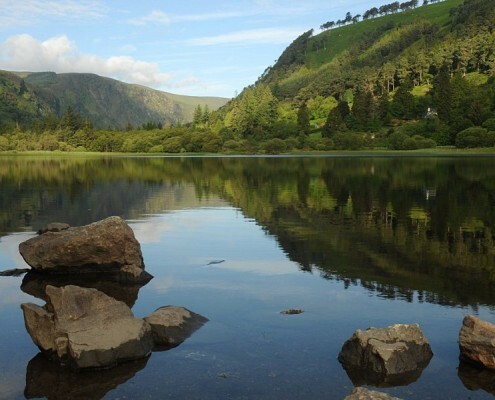 With a little advance notice, guests staying at the Glenmalure Lodge can have a courtesy lift organised in the morning to deposit them in Glendalough. From here, they can set their own pace on the Wicklow Way and follow the little yellow man signs to return back to the Lodge later in the afternoon.